It’s been in the news, in fashion, in health, and beauty magazines - Botox is the gold standard of anti-aging treatments. Having excessive wrinkles and lines can make you look tired and serious. By using your naturally aged features and combining it with state-of-the-art techniques performed by an internationally qualified Botox physician, we can give you a refreshed, naturally younger, relaxed and friendlier look. For women and men seeking a non-surgical, safe and extremely reliable method of reducing the signs of ageing, wrinkles and lines and improve their facial appearance, Botox holds immense potential. It is fast, safe, affordable and extremely effective. 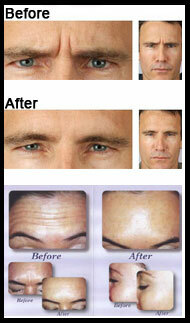 • Delaying the ageing process, preventing lines from forming. • Excessive underarm and facial sweating.